A winery which produced its first vintage just two years ago is celebrating after being named New Zealand Wine Producer of the Year by the International Wine & Spirits Competition. Marisco Vineyards was founded in his native Marlborough by Brent Marris (left), former chief winemaker at both Wither Hills and Oyster Bay. As for more traditional markets, Marris describes the UK as “pretty exciting”, having doubled his volumes here in the last 12 months, although he added: “I’m deciding whether I have to put a brake on because of the exchange rate”. The brand has achieved the same growth levels in Australia, while in Germany Marisco has won exclusive representation for the New Zealand category in the 250 nationwide outlets of Jacques’ Wein Depot. The company also began selling to the US and Canadian markets this year. In his winery, Marris has invested in state-of-the-art equipment, reaching beyond the wine world into wider industry. His pumping system is based on those used in the dairy industry, the meat industry informed his effluent removal technology and he also employed specialist IT technicians. As a final flourish, he revealed that the team behind the winery’s construction even boasted the worldwide director of design for Saatchi & Saatchi. In response to the suggestion that a number of New Zealand Sauvignon Blancs appear to be pursuing aroma at the expense of flavour, Marris emphasised his own approach: “When you pick slightly under- or over-ripe, you end up with dominant, punchy aromas at the start but then it’s quite short in the middle. Now however, he is vinifying his Chardonnay in large, used puncheons using wild yeast. Instead of employing the traditional pigeage lees stirring technique, Marris expressed a preference for rotating the barrel every few days. “It stops the air going in and the dead yeast cells at the bottom end up staying stuck, but the lighter yeasts float around. It’s a gentler approach ­– I don’t want a buttery, Californian style Chardonnay,” he remarked. 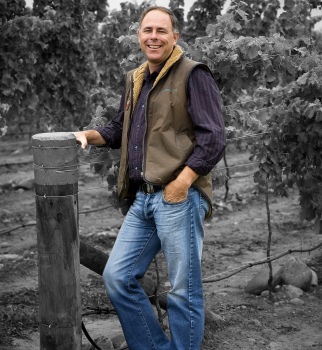 Outlining his future plans, Marris pointed to a further 20 acres left to plant, expressed a desire to “get more Pinot Noir and Chardonnay planted on the cooler sites”, and enthused about a small quantity of “stunning” barrel fermented Viognier, which he is considering for inclusion in his on-trade focused range, The King’s Series.